The Cowboys took down the Cyclones 22-15. STILLWATER — The Cowboys put an end to conference upstart Iowa State’s unbeaten Big 12 run. 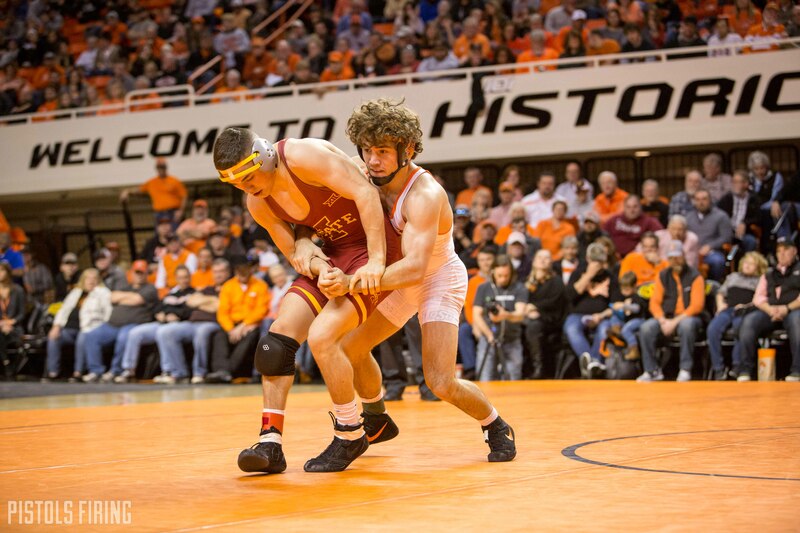 Oklahoma State topped the Cyclones 22-15 in the Pokes’ first dual in Gallagher-Iba Arena since Dec. 9. The win puts OSU at 10-0 on the season, and the Cowboys are 5-0 in conference duals. Two Cowboys scored bonus points, as Joe Smith scored a first-period fall, and Nick Piccininni scored a major decision to advance to 22-0 in his redshirt junior season. Returning All-American Boo Lewallen wrestled his first match of the year Sunday, and all looked to be going well. Lewallen was up on 12th-ranked Jarrett Degen 8-4 before Lewallen got dropped on his previously injured left shoulder. That shoulder was in a wrap. Lewallen was on his back looking up to the GIA ceiling as he yelled and stomped his feet on the mat. After a few moments, the match was conceded to Degen. Down 3-1 in the the third period, Daton Fix scored a huge reversal that sent GIA into a frenzy. Austin Gomez also had his hands locked on the exchange, so all of a sudden, Fix had a 4-3 lead. Gomez was able to escape late in the period, but Fix had a riding time point to project. The match ended with Fix in a split on the north edge of the mat, as Gomez had Fix’s ankle. Fix won the match without scoring a takedown. “It was a good match,” Smith said. “This weight class is loaded. He’s been wrestling all of ’em just about. You gotta be careful about getting in a routine of battling every match to win. You have to battle against (Gomez). (Gomez) is a good wrestler, and he’s shown this year that he can come from behind. He can do a lot of things. The two ranked redshirt freshmen met at the Southern Scuffle. Fix won there, too. It took Joe Smith all of 2:41 to pin Marcus Coleman. It was Smith’s first match in GIA this season and his first career fall in the building. It was the only fall of the day, and it moved fifth-ranked Smith to 14-1 this year. “Every time Joe wrestles, he gets me ready for my matches,” Jacobe Smith said. “He’s my favorite wrestler. His skill, just how he feels when I’m wrestling him. He gives me good feels. I just like watching him. The Cowboys will be back in GIA on Friday night, as they host Northern Iowa at 7 p.m.